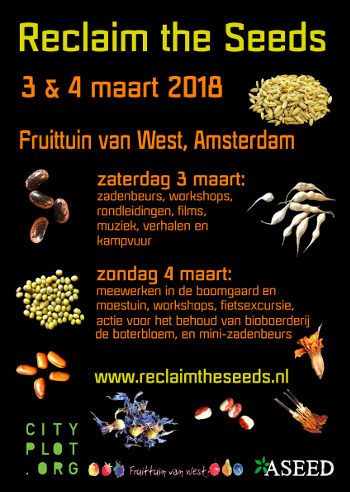 Reclaim the Seeds is an annual event, each year in a different part of the Netherlands, where exchanging seeds and information is combined with discussions about political themes and practical workshops. It started as a protest against new European seed laws, but now the main goal is to involve more people in the struggle against patents in plants and against the ever increasing power of large agricultural corporations. With the event we contribute to the upkeep of agricultural biodiversity and a robust, sustainable agriculture. This year a regional version takes place in Amsterdam in De Fruittuin van West on March 3-4. On the Saturday you can expect and interesting seed fair where gardeners and farmers can swap and sell their self saved seeds. This are often special heirloom, local and/or rare seeds. At the same time there will be a programme with lectures and workshops. The Sunday will be used for a few practical workshops, helping in the orchard and garden, excursions for garden projects in the neighbourhood and a action to save the organic farm De Boterbloem.